FREE Eventm RSVP here! Info about Day One here! altopalo on the cover of Issue #56 of The Deli NYC - now out digitally! Hola, peoples into emerging music! The winter issue of The Deli NYC (our 56th!) is now up on the cloud (HERE), featuring glitch-soul luminaries altopalo on its cover! The issue also tackles the current shift of everything cool from Brooklyn to Queens, and - as usual - highlights many local bands we dig (and their favorite gear). There's also a special about the NAMM show, which we will participate in with our own Stompbox Booth featuring tons of emerging pedal manufacturers! Fresh Buzz and NYC Records of the Month sections are never skipped! Look out for the print version, out at the end of the month. 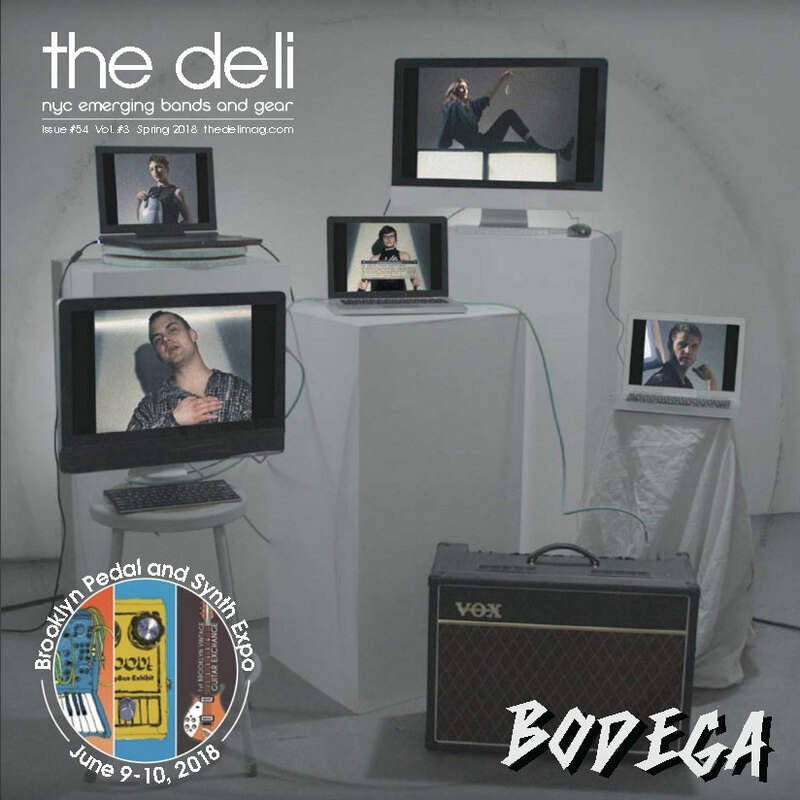 Bodega is on the cover of the 54th issue of The Deli NYC! If there's a turn of phrase we kind of detest here at The Deli is "taking the scene by storm." It's one of those generic prefab sentences that ring insincere. But then again, sometimes, some bands do that - kind of rare, but it happens, right? And sometimes, on a hot day like today, being lazy is kind of inevitable. So... yes! Brooklyn's Bodega are taking the NYC scene by storm with their blend of post-punk and pop and their super-fun live shows. That, and their somewhat familiar name, are the main reasons why they are on the cover of the new, spring 2018 issue of The Deli! The issue, our 54th NYC one, is now up online and you can read it here. It's an issue linked to the biggest event for musicians we've ever organized, which will host a Stompbox Exhibit, a Synth Expo and a Vintage Guitar Exchange in a Bushwick art gallery called Absurd Conclave - hope to see you there! Once a year, The Deli publishes an issue of The Deli that is NOT exclusively focused on NYC acts, but on artists based in all the 11 scenes we cover. That time of the year is now, an that issue is the 8th Austin issue of The Deli, which you can now read online here. The print version of it, in its glorious 7 inch format, will be available in print next week in Austin and in NYC shortly thereafter. On the mag's cover you'll find Toronto's noise rockers FRIGS, whose debut album Basic Behaviour has been rocking our world in the last few weeks. The issue features other incredible emerging artists, including hip hop genius Nnamdi Ogbonnya, talented goofball popper Caroline Rose, and Los Angeles' alt-rockers The Beaches among others - you can listen to all of them in the YouTube playlist below. Also in the issue, an article entitled "Will Rock Explode Again?" which poses pognant questions about the future of rock'n'roll. As usual, in the final pages you'll find a section focused on the guitar pedals and synths involved in our Austin Stompbox and Synth Expo, scheduled for March 16/17 at the Chuggin' Monkey in Downtown Austin! We have a brand new issue of The Deli NYC available online for you - and it's a gooooood one, can read it here! We are super thrilled to have new DFA Records signee Guerilla Toss on the cover (check out their wonderful single "Skull Pop") streaming below. - An ample section dedicated to the gear participating in the Synth Expo. The paper version will be distributed in NYC around October 20th. We've been publishing the yearly Austin issue of The Deli (coinciding with SXSW) since 2011, and it's our only print issue that's not exclusively focused on just NYC artists. After last year's fun, "PsycheDelic" approach, we decided to dedicate this year's issue almost entirely to synth and pedals (and bands of course! ), in an effort to promote our Austin Stompbox Exhibit and Synth Expo - which, if you are a gear geek heading to Austin next week, should not miss! However, the highlight of this issue is an article about women and technology. Hope you enjoy it! LISTEN TO A PLAYLIST OF THIS ISSUE HERE (or below)! P.S. You'll see the printed issue in Austin next week and in NYC the week after.